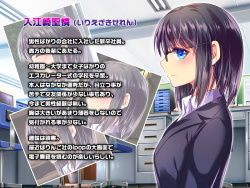 "My Cute Junior Co-worker ~Now my WIFE~"
with every single CG newly drawn. CG collection with simple text about a new office girl in glasses. A dream comes true...! A relationship starting from amorous delusions. From the beginning to the happily ever after end. All bundled up nice and simple. 7 CG base images, Total 238.